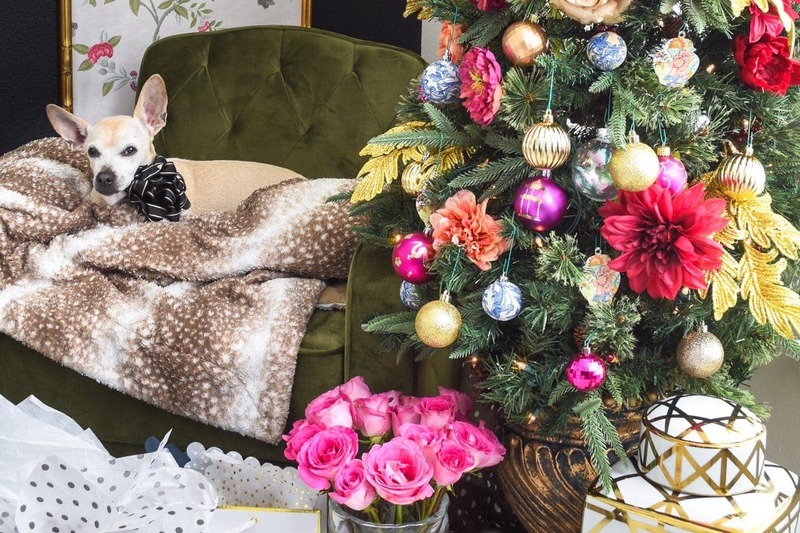 If you love Christmas and holiday home decor tours, then you’ll really LOVE my content this week. 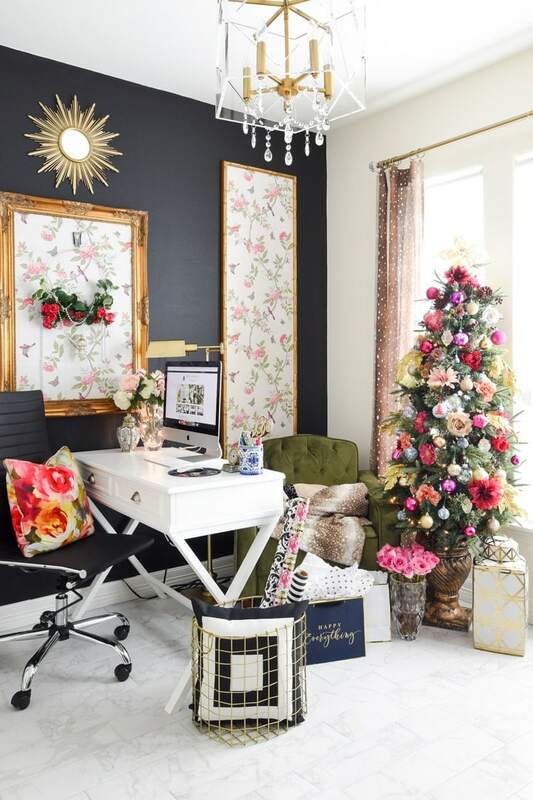 My glam, floral and COLORFUL Christmas decorations today will focus on one of my favorite rooms in my house- my girl boss home office! If you’ve landed here from friend Ariel’s blog, PMQ for Two, then I know you have an affinity for all things colorful, eclectic, and fun. I adore Ariel and her unique style, so I am absolutely thrilled to have you here. HUGS! 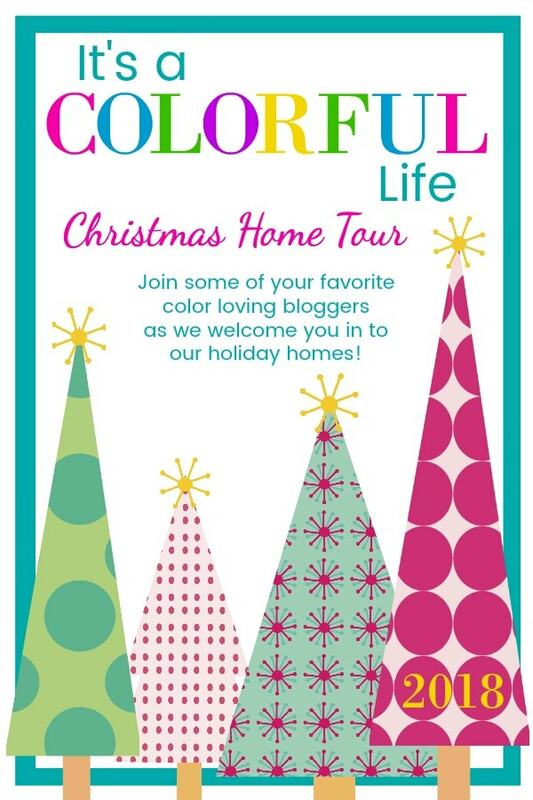 Also, a shout out to my friend Jennifer from Dimples & Tangles and from Rachel from Pencil Shavings Studio for inviting me on the It’s A Colorful Life Christmas Home Tour! 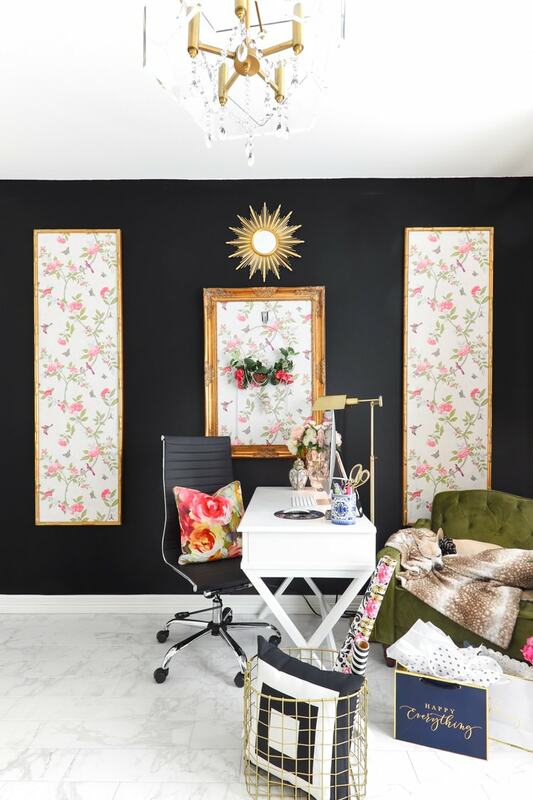 My home office got a tiny facelift early this year, but I really started changing things up last weekend when I painted a black accent wall. Tricorn black to be exact. 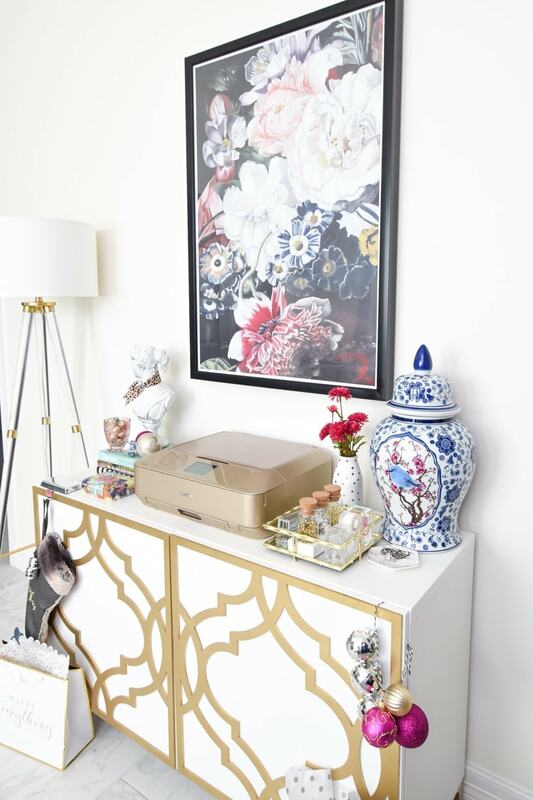 I simply love how my DIY bamboo and chinoiserie wall panels turned out when set against the dramatic black. 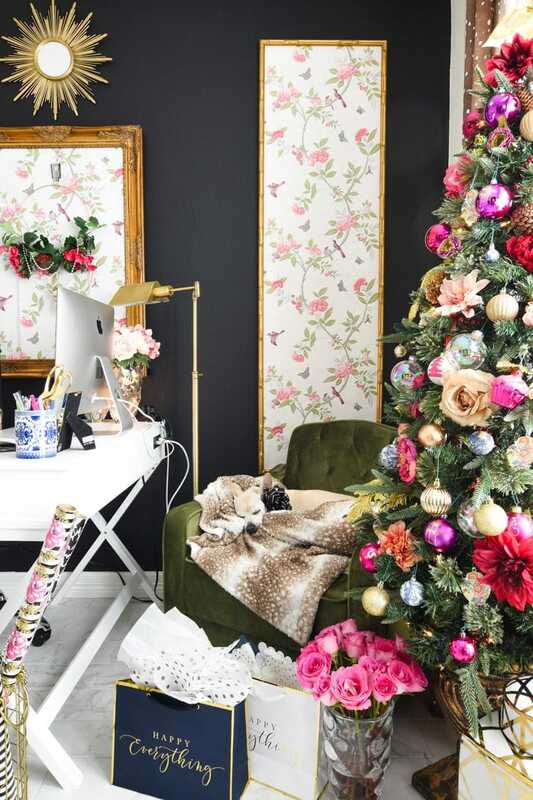 To keep the girly, floral vibe going, I decided to do a colorful, floral chinoiserie inspired Christmas tree. There’s a lot of DIY ornaments on this tree. 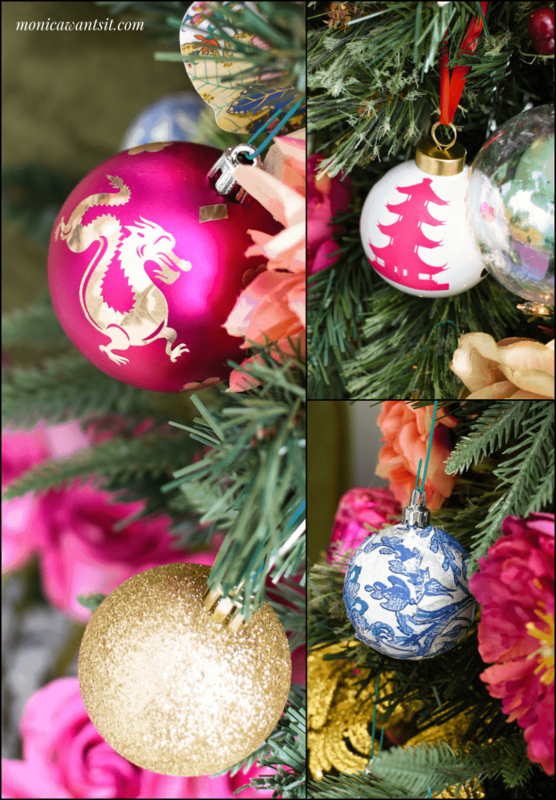 My DIY blue and white chinoiserie ornaments are on here, as well as some pagoda and dragon ornaments I made using my craft cutter. 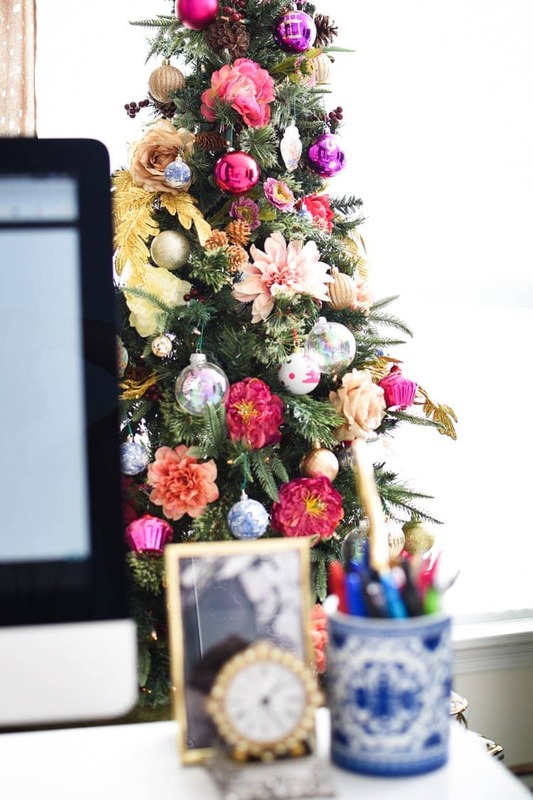 In my office, I have this bin full of random flowers that I clipped for projects/filler, so I stuck those all over the tree. And funny story…while setting up this tree, it literally broke! If you’re thinking, “boy, that looks a little crooked”, you’re not wrong. I have it leaning against the wall and crossing my fingers it stays put until December 26. The green chair from my black and gold master bedroom makeover has made it’s way over here so my darling Pee Wee has somewhere to perch and keep me company. By keep me company, I mean take naps, obviously. Over by my desk, I have a memo board I made using foam core board, wallpaper, and a GIANT frame I bought at an estate sale. 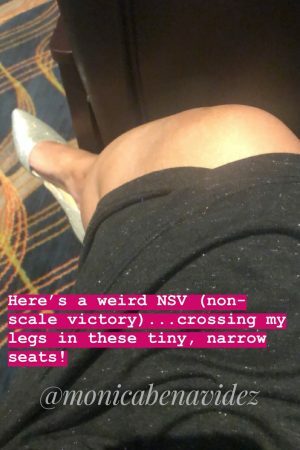 I also have a swivel brass floor lamp so I can use it for reading in the chair OR to provide light to my desk without taking up any precious desk real estate. 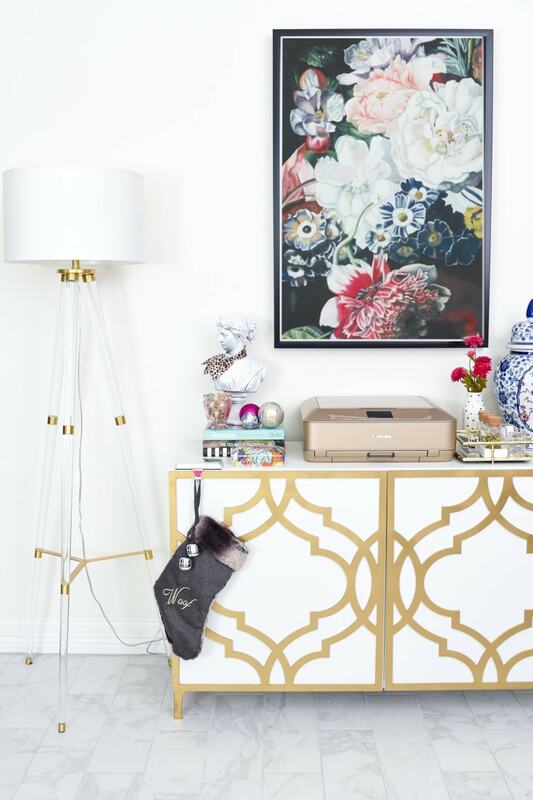 A simple gold and holly wreath from IKEA hangs on the memo board. The wreath was under $5 and I am so wishing I would have bought more than one. 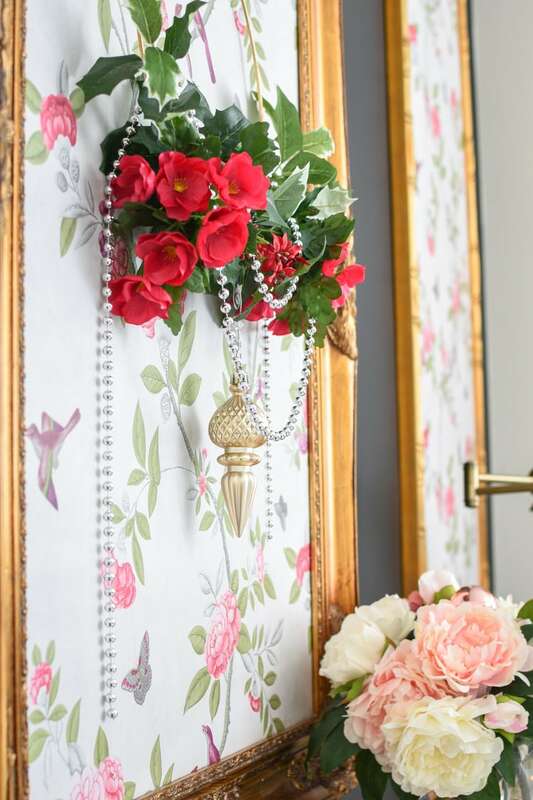 All I added to the wreath were some florals, a beaded garland and a single ornament hanging down the center. 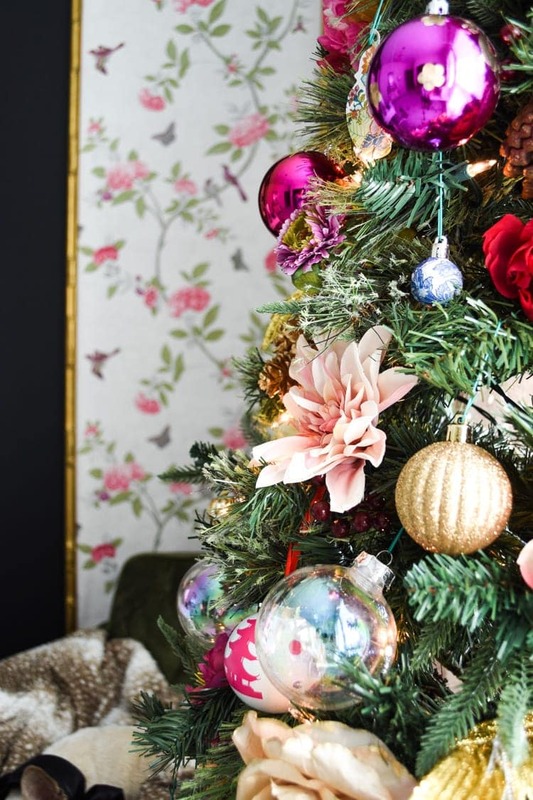 Colorful Christmas decorations can often be bold AND simple. This whole corner just makes me feel incredibly happy. It is just what I envisioned, and my office isn’t anywhere near being done yet. My new desk and rug come in soon. I know the layout is a bit untraditional, but I love how it works for now. Plus, you can’t beat this view. The wall to the left of my desk has my DIY IKEA Besta hack using O’verlays! I store a ton of craft supplies in this unit, and I also have some of my supplies and pretty decor on top for easy access. You might be wondering why I haven’t shown the other angle (to the right of this corner), and it’s because it’s a hot mess. Just trust me on this. I do love my black interior doors though. 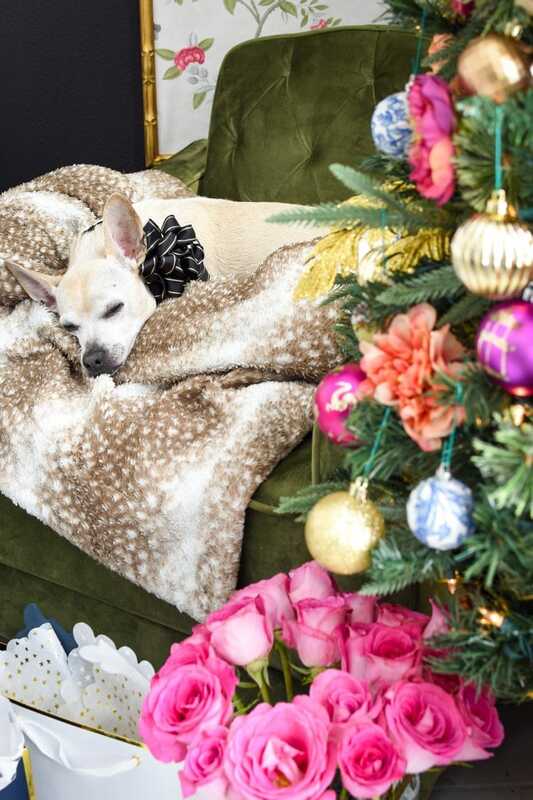 Black and white is such a timeless color combo, and it allows for my colorful Christmas decorations to really take center stage. The antelope/fawn curtains also help warm it up and not make it feel so stark. 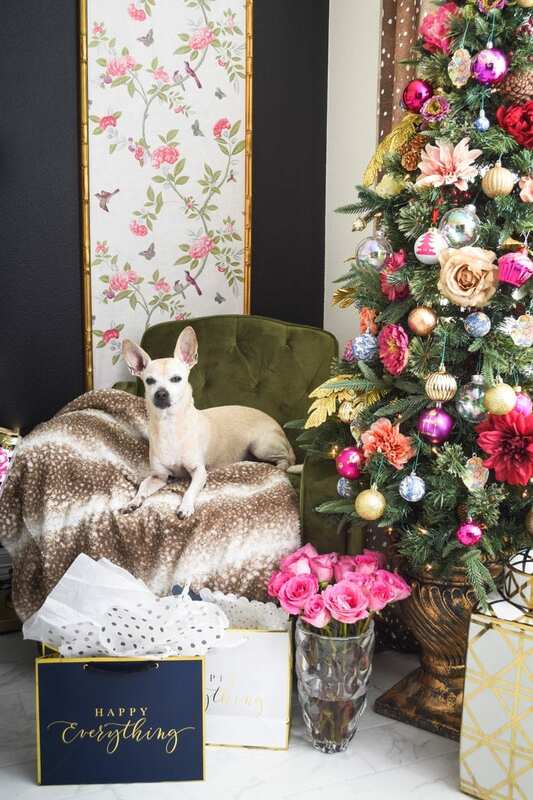 I’ll be sharing my colorful Christmas decorations in my dining room tomorrow, so make sure to swing by or subscribe if you want to see more of my home. Thursday will feature my foyer and living room. 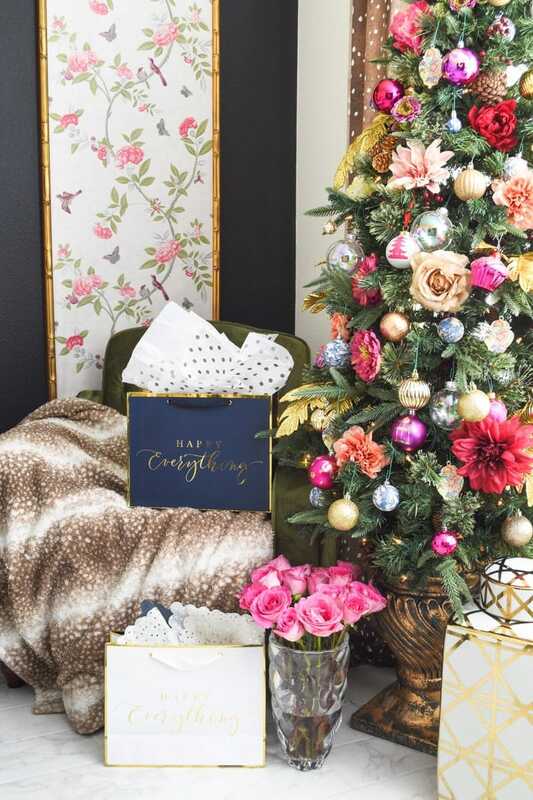 I’ve already shared my blue and white Christmas kitchen decor and my monochromatic gold and crystal master bedroom holiday decor if you want to check those out. I now hand you off to the insanely talented and fabulously chic Camila over at Effortless Style. I’ve been following her FOREVER, and I kinda had a fan girl moment when she followed me on Instagram and started replying to my IG stories! 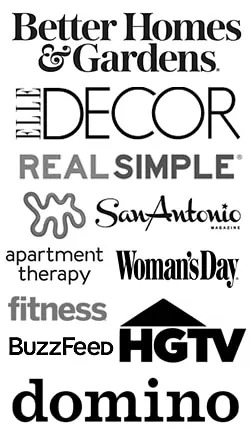 Other talented design bloggers are sharing their colorful Christmas decorations all week- the full line up is below. Enjoy! 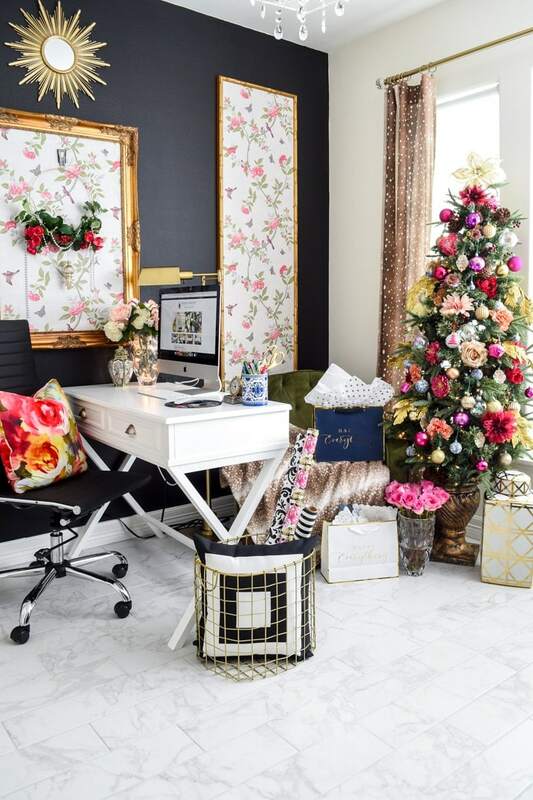 Monica, your office is #GOALS! 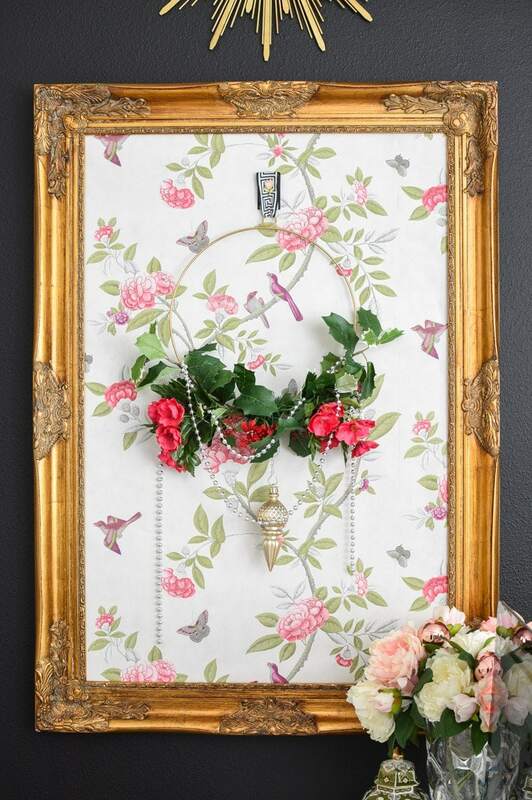 The wall is so dramatic and makes all your beautiful decor just pop! I would never the tree was broken if you didn’t say, it’s absolutely gorgeous! Monica, it’s beautiful! 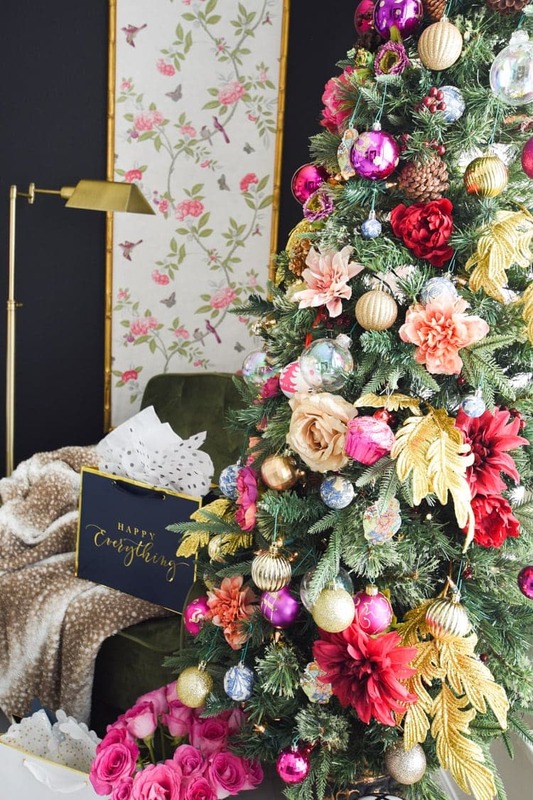 I love all the color – especially those pagoda ornaments! 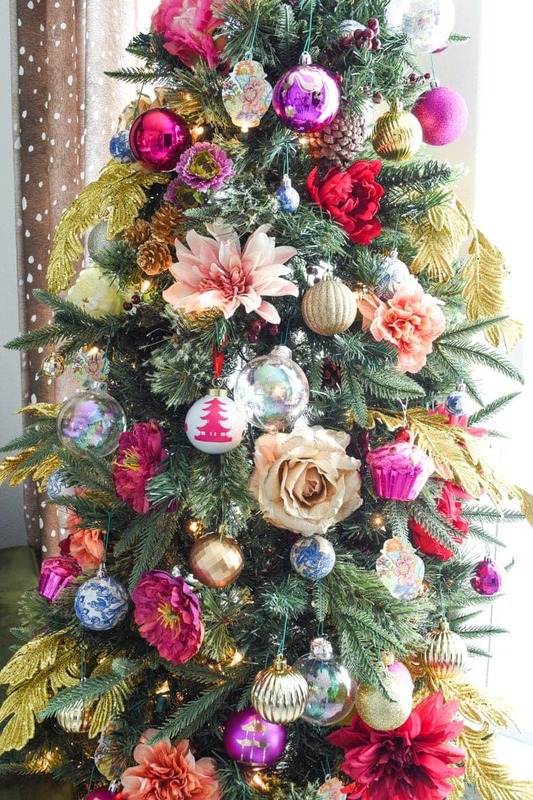 And I love how you mixed the flowers in on the tree as well! So creative! 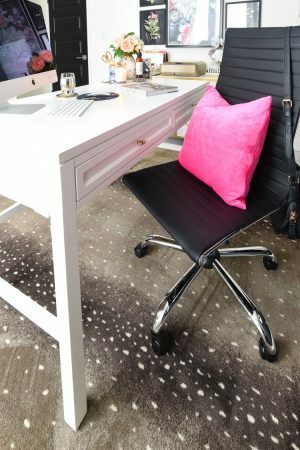 Monica your office space is beautiful! 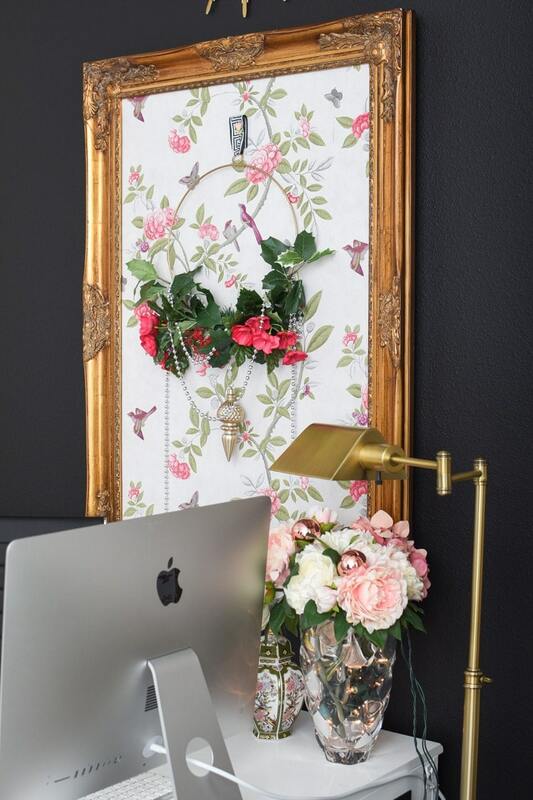 I love how feminine and happy it is with all the color and floral touches, and Tricorn Black looks great as a backdrop! I have that color on my son’s walls and love how versatile it is. Enjoy your festive home my friend! That wall is just stunning! Tricorn Black is my go-to color! All of your DIY ornaments are so creative and unique. Your office is so inspiring, loved your tour and so happy that you joined us for It’s a Colorful Life! 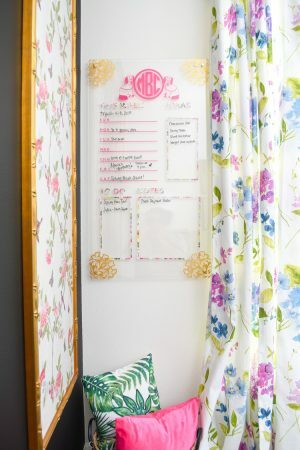 I came for the curtain panels but now I’m staying for everything else. I’m in love. I need this office but then would I just stare at it all day and get no work done????? ?